The genus name, Alchemilla is from the Arabic, alkemelych, meaning "alchemy," as alchemists believed that the morning crystal dewdrops in this plant, which they called "Heaven’s Water" held magical powers to help them in their work. This herb was used to staunch bleeding on the battlefields of the 15th and 16th centuries. At one time, the astringent effects of this plant were marketed as a virginity restorative. To the Icelandic people, Lady’s Mantle has been long considered sacred. The leaves and flowering shoots are used as an anti-inflammatory, antimicrobial, astringent, styptic, tonic and vulnerary for skin. Its high tannin content gives it constricting properties, thus reducing the appearance of large pores, and its flavonoid content gives it anti-inflammatory and antioxidant properties. Lady’s Mantle is used in lotions to soften rough skin or minimize enlarged pores and birthmarks. The juice or teas of Lady’s Mantle is applied to acne and used as a facial steam for acne. It is also used as an eyewash for conjunctivitis, a mouthwash for sores or after dental extraction, and as a gargle for laryngitis. Lavender oil is one of the only essential oils that can be applied undiluted, or “neat,” to the skin. It is a remedy for sunburns and burns, prevents wrinkles and scarring, and soothes and heals insect bites. It also helps to prevent infection; for example, a drop or two of undiluted lavender essential oil can be applied topically to dispel a pimple before erupting. Lavender is used in skin formulas as facial steams, cleansers, toners, lotions, soaps, massage oils and foot soaks. Misting oneself several times daily with lavender water helps to moisturize the skin and improve one's mood. 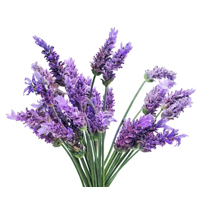 The aroma of lavender is described as a smooth, sweet floral top-middle note with an herbaceous undertone. Lavender oil is a potent healing agent both mentally and physically. Its properties for mind include: calming, relaxing, clarifying, stimulating, healing and appeasing. Emotional benefits include ease of: anxiety, depression, hysteria, impatience, fatigue, shock, suspicion and tension. As a powerful relaxant it is used to treat insomnia just place some on a white pillowcase before bed. The word “lavender” is actually derived from the Latin lavare meaning "to wash" as this herb has such a long tradition in cleansing. This species is known as English lavender. Its properties for skin include: anti-inflammatory, anti-irritant, antimicrobial, strongest gentle antiseptic, astringent, cell regenerating, cleansing, demulcent, deodorant, healing, rejuvenating, and balances sebum production. The active constituents of lavender include: terpenes such as linalool, lavandulyl acetate (named for the plant), tannins, flavonoids and phytosterols. Lavender can be used by all skin types and is safe for everyone including children and pregnant women, but is best for blemished, delicate-sensitive, oil-rich, pale-devitalized and traumatized skin. It is also used in treating almost any skin condition including: acne, allergies, anxiety, athlete’s foot, blackheads, bruises, burns, chapped skin, dehydration, dermatitis, eczema, inflamed skin, muscles aches, sagging skin, seborrhea, sensitivity, spider veins and stretch marks. Also referred to as Melissa, this fresh, citrus herb was included in Carmelite Water, a popular toilet water used by men and women of culture during medieval Europe. Its properties for skin include: antiseptic, antiviral, cleansing, demulcent, healing, pH balancer and rejuvenating. It is used in treating: acne, dermatitis, eczema, insect bites and rashes. Lemon balm is best for blemished, irritated skin. Its active constituents include: terpenes, which produce relaxing qualities, hydroxycinnamic acid derivatives such as rosmarinic acid, and flavonoids. The leaves have been used as a compress or poultice for boils, shingles, insect bites, in facial steams and toners for blemishes, and as a rejuvenating agent. The diluted essential oil is used topically on herpes lesions. It is also included in perfumes, bath oils and massage oils. Its properties for mind include: appeasing, comforting, soothing and uplifting. Emotional benefits include ease of emotional shock or grief, depression and insomnia. Lemon essential oil is obtained by cold press of the peel. Its properties for skin include: antiseptic, astringent, bactericide, detoxifying, cooling, healing, lymphatic stimulant and rejuvenating. The active constituents in lemon oil include: terpenes, flavonoids (such as hesperitin and naringenin, coumarins, carotenoids and citric acid. Lemon oil is good for the following skin conditions: acne, seborrhea, wrinkles and warts. It also brightens dull skin and reduces cellulite and varicose veins. Best for blemished, normal- combination and oil-rich skin types. What makes the properties in lemon oil noteworthy is that they are combined with a delightful aroma and work synergistically on a therapeutic, aesthetic and emotional level. Lemon’s aroma is described as a fresh, light citrus top-note. Its properties for mind include: calming, energizing, relaxing, stimulating and uplifting. Emotional benefits include ease of: aggression, depression, fatigue and tension. The leaves of lemongrass are an important aromatic and powerful antiseptic agent. Additional properties for skin include: antimicrobial, mildly astringent, deodorizing, detoxifying and disinfecting. Best for normal to oily, and oily skin, lemongrass is also good for mature, sagging and devitalized smoker’s skin (helps to eliminate wastes). It is a tonic for open pores. In the form of facial steams, cleansers, soaps and bath herbs, lemongrass is used for oily, acneic skin and to fight skin infections. Lemongrass is excellent for oily, dandruff and blond hair when used in shampoos, conditioners and hair rinses. The essential oil (also known as citronella) is used in deodorants, perfumery, insect repellents, and cures for athlete’s foot. Good for stress, lemongrass is calming. The essential oil is also used as an appetite suppressant. The leaves of lemongrass are an important aromatic and powerful antiseptic agent. Additional properties for skin include: antimicrobial, mildly astringent, deodorizing, detoxifying and disinfecting. Best for normal to oily, and oily skin, lemongrass is also good for mature, sagging and devitalized smoker’s skin (helps to eliminate wastes). It is a tonic for open pores. In the form of facial steams, cleansers, soaps and bath herbs, lemongrass is used for oily, acneic skin and to fight skin infections. Lemongrass is excellent for oily, dandruff and blond hair when used in shampoos, conditioners and hair rinses. The essential oil (also known as citronella) is used in deodorants, perfumery, insect repellents, and cures for athlete’s foot. Good for stress, lemongrass is calming. The essential oil is also used as an appetite suppressant. Licorice has a long and highly valued record of uses. For example, it remains one of the most important herbs in traditional Chinese medicine (TCM). Among the most consistent and important uses are as a demulcent (soothing, coating agent), which makes licorice perfect for sensitive skin. Licorice root is a very effective anti-inflammatory and anti-irritant, which inhibits the breakdown of cortisol produced in the body. It is also antiviral, antibacterial, antifungal, and a potent antioxidant. Its active constituents include: triterpene saponins (such as glycyrrhizin, glabridin, soya saponins), flavonoids, coumarins and terpenes. Licorice extract is thought to have a depigmenting effect as well as an inhibitory effect on melanin synthesis as a result of its ability to act as a tyrosinase inhibitor. Its uses include treatment for: chronic fatigue syndrome, cold sores, eczema, fibromyalgia, menopause and peptic ulcers. Lime is a useful cooling, toning and astringent oil for skin care blends. It is also used for varicose veins. Lime is refreshing, especially in hot weather. It inspires the mind and elevates the spirit with its aroma, a fresh, sharp citrus top note. Additional properties for the mind include: antidepressant, energizing and relaxing. The linden flower is used cosmetically for its antiseptic and sedative qualities. Its main active constituents are flavonoids and glycosides. Linden helps to leave the skin smooth and soft, and minimizes wrinkles. It also helps to heal blood vessel walls and is used to clear acne and rashes as well as to treat burns. Linden is included in facial waters, facial steams, masks, lotions, moisturizers, soaps and relaxing bath herbs, as well as in shampoos, conditioners and hair rinses. Another use is as a nervine proscribed by herbalists in treating restlessness, hysteria, headaches and stress. Lotus flowers are antioxidant, astringent, soothing, and cooling. The Sacred water lotus has been used in the Orient as a medicinal herb for well over 1,500 years, and is also an important religious, artistic, and folklore icon. It was brought to India from Egypt, where it was associated with the sun: the lotus, like the sun, opened in the morning and closed at night. It was also associated with the god Horus, who was often depicted sitting or standing on the lotus, like Brahma and the Buddha after him. In Egypt the flower was blue and white, and was seen as a flower of resurrection, and used in funeral rights and depicted in the artwork in tombs. In India it represents birth and rebirth; Brahma was born seated on a lotus flower. Lotus flowers are seen in these cultures as bearing prosperity and fertility, and allowing the inner being to bloom. All of parts of the plant may be used. See also lotus leaf extract more.